Download "GUIDE TO CARRYING OUT A SUPERVISED FIRE EVACUATION DRILL"
1 UCL Fire Technical Note - TN103 Fire Safety Technical Guide 1.0. 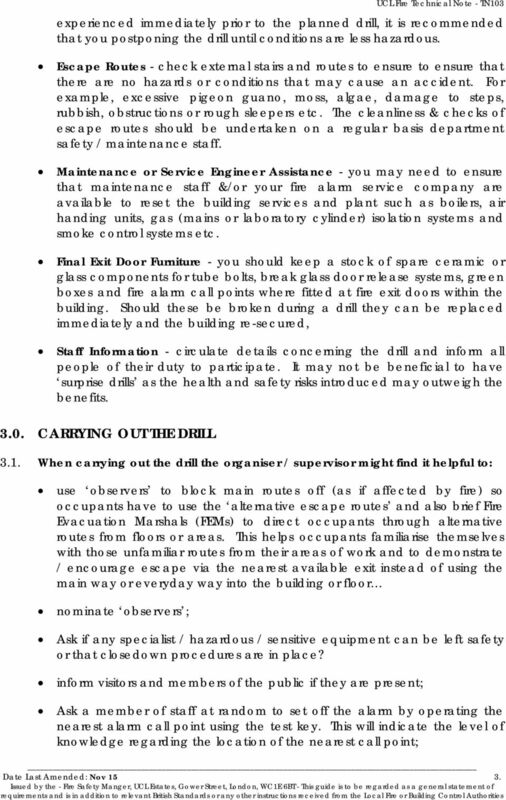 INTRODUCTION GUIDE TO CARRYING OUT A SUPERVISED FIRE EVACUATION DRILL 1.1. UCL premises forming part of the Bloomsbury Campus receive a supervised formal Fire Evacuation Drill on an annual basis that is carried out at the start of the Autumn Term (October) of each year by the UCL Fire Safety Manager Heads of Departments [ Duty Holders to the UCL Responsible Person ] in control of UCL premises and campus sites that are not included in these organised fire drills are to ensure that they carry out a supervised annual fire drill, which is formally recorded. Additionally, any unscheduled alarm activations should be treated as a supplementary fire evacuation drill. These unwanted alarms however, do not obviate the need for an annual recorded supervised fire drill The purpose and the objectives of any fire evacuation drill include: To identify any weaknesses in the evacuation strategy; To test the procedure following any recent alteration or changes to working practices; To familiarise new occupants with procedures; To test the arrangements for disabled people, To identifying weaknesses in emergency communications procedures and systems; To identifying positive and negative reactions of staff with designated responsibilities such as Fire Evacuation Marshals (FEMs); 1.4. Who Should Take Part - the evacuation should be for all occupants of the building except those who may need to ensure the security of the premises, or people who, on a risk-assessed basis, are required to remain with particular equipment or processes that cannot be closed down Premises that consist of several buildings on the same site should be dealt with one building at a time over an appropriate period unless the emergency procedure dictates otherwise. Date Last Amended: Nov 15 1. 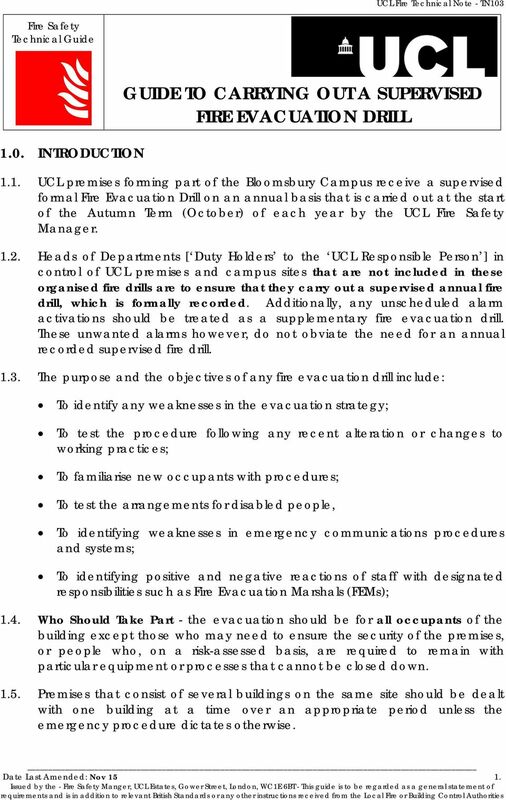 2 UCL Fire Technical Note TN Where appropriate, you may find it helpful to include members of the public in your fire drill - ensuring that all necessary health and safety issues are addressed before you do so The Head of Department should nominate a suitable person such as the Department Safety Officer (DSO), Building or Facilities Manager to organises & supervise the fire drill. Generally, the drills should not take any longer than minutes or so complete and provide minimum disruption UCL as Tenants - where the Department is in a commercial property, then the fire drill and liaising with other occupants etc, would be the Landlord or Letting Agents responsibility. 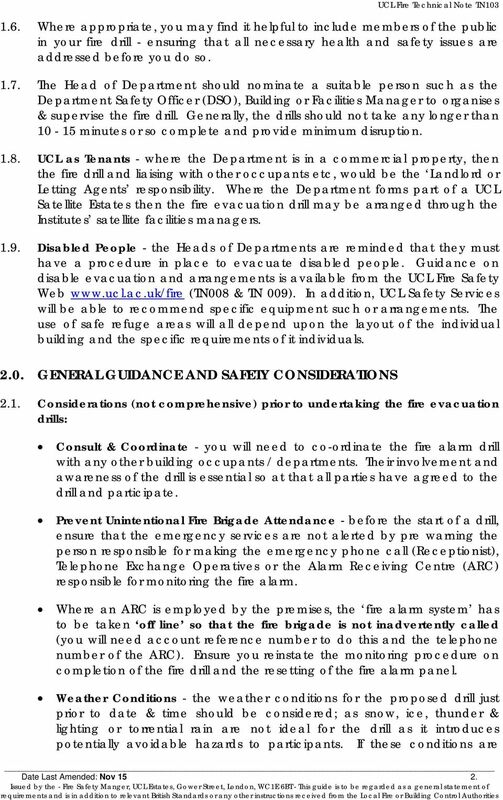 Where the Department forms part of a UCL Satellite Estates then the fire evacuation drill may be arranged through the Institutes satellite facilities managers Disabled People - the Heads of Departments are reminded that they must have a procedure in place to evacuate disabled people. Guidance on disable evacuation and arrangements is available from the UCL Fire Safety Web (TN008 & TN 009). In addition, UCL Safety Services will be able to recommend specific equipment such or arrangements. The use of safe refuge areas will all depend upon the layout of the individual building and the specific requirements of it individuals GENERAL GUIDANCE AND SAFETY CONSIDERATIONS 2.1. Considerations (not comprehensive) prior to undertaking the fire evacuation drills: Consult & Coordinate - you will need to co-ordinate the fire alarm drill with any other building occupants / departments. Their involvement and awareness of the drill is essential so at that all parties have agreed to the drill and participate. Prevent Unintentional Fire Brigade Attendance - before the start of a drill, ensure that the emergency services are not alerted by pre warning the person responsible for making the emergency phone call (Receptionist), Telephone Exchange Operatives or the Alarm Receiving Centre (ARC) responsible for monitoring the fire alarm. Where an ARC is employed by the premises, the fire alarm system has to be taken off line so that the fire brigade is not inadvertently called (you will need account reference number to do this and the telephone number of the ARC). Ensure you reinstate the monitoring procedure on completion of the fire drill and the resetting of the fire alarm panel. Weather Conditions - the weather conditions for the proposed drill just prior to date & time should be considered; as snow, ice, thunder & lighting or torrential rain are not ideal for the drill as it introduces potentially avoidable hazards to participants. If these conditions are Date Last Amended: Nov 15 2. 3 UCL Fire Technical Note - TN103 experienced immediately prior to the planned drill, it is recommended that you postponing the drill until conditions are less hazardous. Escape Routes - check external stairs and routes to ensure to ensure that there are no hazards or conditions that may cause an accident. For example, excessive pigeon guano, moss, algae, damage to steps, rubbish, obstructions or rough sleepers etc. The cleanliness & checks of escape routes should be undertaken on a regular basis department safety / maintenance staff. Maintenance or Service Engineer Assistance - you may need to ensure that maintenance staff &/or your fire alarm service company are available to reset the building services and plant such as boilers, air handing units, gas (mains or laboratory cylinder) isolation systems and smoke control systems etc. Final Exit Door Furniture - you should keep a stock of spare ceramic or glass components for tube bolts, break glass door release systems, green boxes and fire alarm call points where fitted at fire exit doors within the building. Should these be broken during a drill they can be replaced immediately and the building re-secured, Staff Information - circulate details concerning the drill and inform all people of their duty to participate. It may not be beneficial to have surprise drills as the health and safety risks introduced may outweigh the benefits CARRYING OUT THE DRILL 3.1. When carrying out the drill the organiser / supervisor might find it helpful to: use observers to block main routes off (as if affected by fire) so occupants have to use the alternative escape routes and also brief Fire Evacuation Marshals (FEMs) to direct occupants through alternative routes from floors or areas. This helps occupants familiarise themselves with those unfamiliar routes from their areas of work and to demonstrate / encourage escape via the nearest available exit instead of using the main way or everyday way into the building or floor nominate observers ; Ask if any specialist / hazardous / sensitive equipment can be left safety or that closedown procedures are in place? inform visitors and members of the public if they are present; Ask a member of staff at random to set off the alarm by operating the nearest alarm call point using the test key. This will indicate the level of knowledge regarding the location of the nearest call point; Date Last Amended: Nov 15 3. 4 UCL Fire Technical Note TN103 ensure FEMs direct occupants to the assembly point and provide control where there is road traffic etc. ; the lifts must not be used in the event of a fire with exception of designated evacuation lifts operated by trained personnel; Encourage FEMs to report that there areas are clear to the Senior Fire Evacuation Marshal (SFEM) and if they are aware of the location of any person(s) remaining in the building. This will normally only be those with disabilities or specific safety duties; The SFEM should be prepared to give information to the Fire Brigade as if it were an emergency. 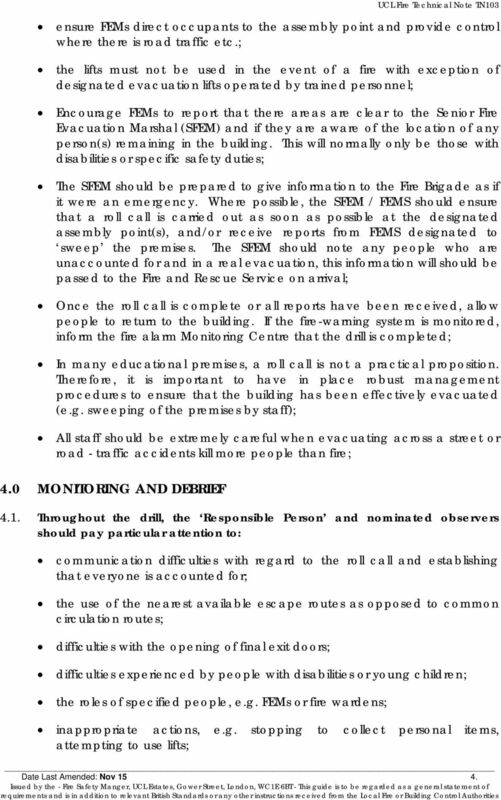 Where possible, the SFEM / FEMS should ensure that a roll call is carried out as soon as possible at the designated assembly point(s), and/or receive reports from FEMS designated to sweep the premises. The SFEM should note any people who are unaccounted for and in a real evacuation, this information will should be passed to the Fire and Rescue Service on arrival; Once the roll call is complete or all reports have been received, allow people to return to the building. If the fire-warning system is monitored, inform the fire alarm Monitoring Centre that the drill is completed; In many educational premises, a roll call is not a practical proposition. Therefore, it is important to have in place robust management procedures to ensure that the building has been effectively evacuated (e.g. sweeping of the premises by staff); All staff should be extremely careful when evacuating across a street or road - traffic accidents kill more people than fire; 4.0 MONITORING AND DEBRIEF 4.1. Throughout the drill, the Responsible Person and nominated observers should pay particular attention to: communication difficulties with regard to the roll call and establishing that everyone is accounted for; the use of the nearest available escape routes as opposed to common circulation routes; difficulties with the opening of final exit doors; difficulties experienced by people with disabilities or young children; the roles of specified people, e.g. FEMs or fire wardens; inappropriate actions, e.g. stopping to collect personal items, attempting to use lifts; Date Last Amended: Nov 15 4. 5 Windows and doors not being closed as people leave. UCL Fire Technical Note - TN ON COMPLETION OF THE FIRE DRILL On the spot debriefs are useful to discuss the fire drill, encouraging feedback from everybody. Later, reports from FEM and observations from people should be collated and reviewed. 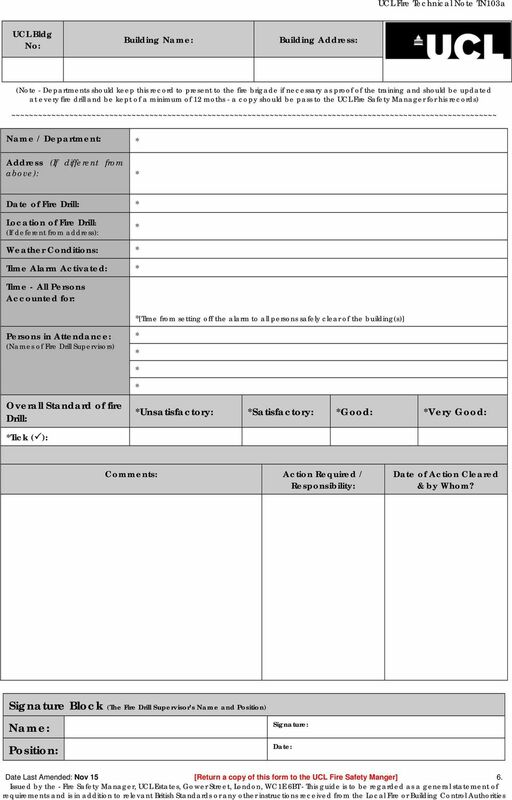 Any conclusions and remedial actions should be recorded and implemented; A records should be kept include the time taken for the last person to leave the building after the activation of the alarm; A specimen Fire Drill Record form (TN103a) can be found below when completed a copy is sent to the UCL fire safety manager for his records and a copy kept for the fire brigade should the wish to see evidence of a fire drill. Date Last Amended: Nov 15 5. 1 PREFACE. This booklet is about fire safety in offices, shops, restaurants and other public places - anywhere people are employed to work. ********* Shorter notice periods will be considered, however this will be at the discretion of the University. FIRE PREVENTION & INVESTIGATION DIVISION 125 Idylwyld Drive South Saskatoon, SK S7M 1L4 Phone: (306) 975-2578 Fax: (306) 975-2589. Bastille Court 2 Paris Garden London SE1 8ND Telephone: 020 7902 5314 Fax: 020 7902 5301 E-mail: training@thefpa.co.uk Web: http://www.thefpa.co.